Nepal’s Island Peak (Imja Tse) is an extension of a ridge coming down off the south end of Lhotse Shar and is one of the most popular trekking peaks given its lack of difficulty (alpine grade PD+) and its accessibility. 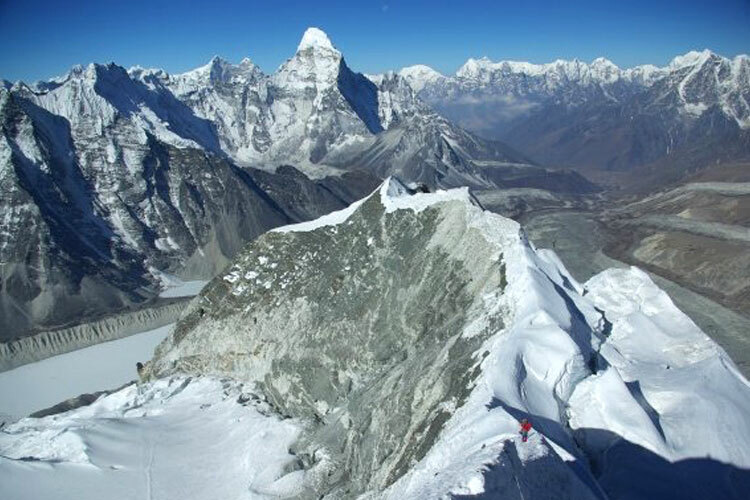 The views from the summit are spectacular, surrounded by Nuptse (7,879m), Lhotse (8,501m), Lhotse Shar (8,383m) and the shapely Ama Dablam (6,856m). Also in view are Makalu (8,475m) and Baruntse (7,720m). 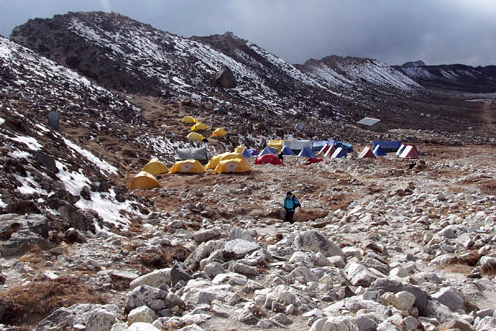 The trek overlaps considerably with the Everest Base Camp Trek and to an extent with the Gokyo, Chola La, Everest Base Camp Trek. 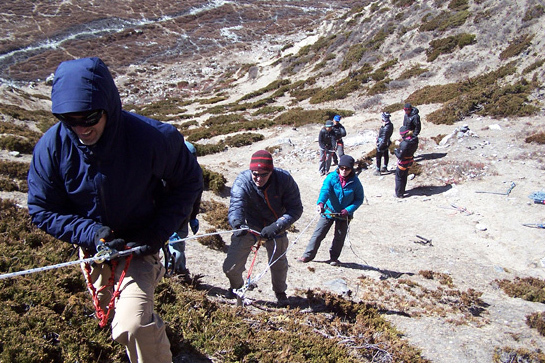 To reach the summit of this trekking peak we will cross grassy slopes and rocky outcrops, cross a broad gully, scramble to a ridge, climb a glacier, avoid crevasses, ascend a steep snow-covered gully and follow a ridge to the top. This climb is reputedly harder work in the spring than the autumn. Ice axes and ropes will be carried by your guides and we may need to use them on the steeper parts. Imja Tse is a good non-technical climb with some challenges, its biggest disadvantage is its popularity. Like most peaks this is best climbed late September to mid/late November or between late-March and mid-May. This is a camping trek, though tea-houses can be lodged in much of the way. Day 1 Kathmandu via Lukla to Phakding (2,650m) Your trekking guide will come to your hotel and, after breakfast, we take a spectacular flight from Kathmandu to Lukla, perched at 2,860m in the Khumbu Valley, with unforgettable views of the terraced landscape and river valleys below, as well as close-ups of some of the world’s highest mountains. We then take a short trek to Phakding passing mani walls (rocks with carved Buddhist prayer inscriptions), small villages and terraced hillsides. (40 minute flight and 3 hour trek). Day 2 Phakding to Namche Bazaar (3,450m) The trek meanders up the Dudh Kosi river valley before we begin a steep hike up to where we’ll get our first view of Thamserku (6,623m), a peak rising to the east of Namche Bazaar. From the pretty village of Benkar the trek heads back to cross the Dudh Kosi before we hike up through magnificent forests of rhododendron, magnolia and fir interspersed with villages. The trek descends dramatically to recross the Dudh Kosi and from the confluence of the Dudh and Bhote Kosi we begin a 2 hour hike up through dense pine forests to Namche Bazaar, a busy attractive little trading town with shops, tea-houses, e-mail cafes etc. (6 hour trek). Day 3 An Acclimatization Day in Namche Bazaar Enjoy the beauty of this quaint village as well as the friendliness and hospitality of its people. Trekkers may visit the local museum containing exhibits displaying the area’s native flora and fauna as well as the history of the Mt Everest region. Other options include a 3 hour return trek to Chhorkung, a 6 hour return trek to Thame or a 4 to 5 hour round trek through the villages of Zarok, Shyangboche, Khunde and Khumjung with their awesome mountain backdrops. Ask your guide for advice and company. On Saturday mornings there is a bigger market. Day 4 Namche Bazaar to Tengboche (3,870m) We begin our day’s trek with unforgettable views of Mts Everest, Nuptse, Lhotse, Cholatse, Kangtega, Ama Dablam, considered the most beautiful of them all, and Thamserku. 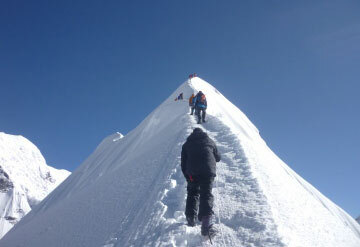 The first 3 hours, to Phunki, is quite easy hiking and is followed by a 3 hour trek up to Tengboche. The gompa (monastery) here is a World Heritage Site which can be visited for self-purification (go on you need it). (6 hour trek). Day 5 Tengboche to Dingboche (4,350m) We trek through shady forests filled with of a variety of trees, birch, conifers and rhododendron, with the image of Ama Dablam dominating the skyline. From Orsho we trek along the bank of the Imja Khola before hiking up for an hour to just above the tree line and the pleasant village of Dingboche. It can get a bit cold here so we might need our down jackets. (4 hour trek). Day 6 Dingboche to Chhukung (4,710m) As we trek up from Dingboche we can again admire Ama Dablam. We hike across barren moraines before crossing the Niyang Khola on stepping stones near a lonely tea-house at Bibre. From here it’s a 1 hour hike to Chhukung, a hamlet nestling in the moraine. (4 hour trek). 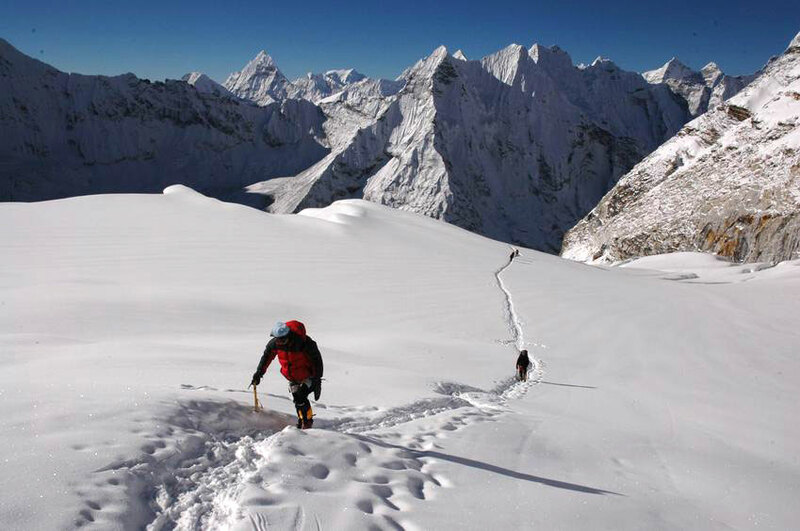 Day 7 Chhukung to Island Peak Base Camp (5,240m) The trek follows the moraine of the massive Imja glacier. (4 hours). Day 8 Island Peak Base Camp to Island Peak High Camp (5,600m) We trek uphill on an easy path over slabs and boulders to IPHC. (2 hour trek). Day 9 Island Peak High Camp to Chhukung via Island Peak (6,187m) We trek out of high camp in the early hours and the hike to the summit is a good one on rocks and scree. 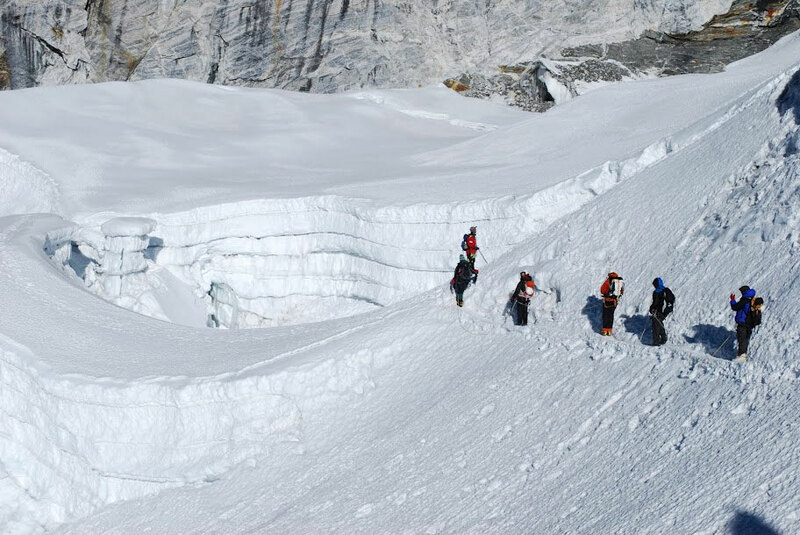 Then we take out our ice-axe and put on our crampons for the final few hours of roped-up trekking on the snow slopes to the summit. 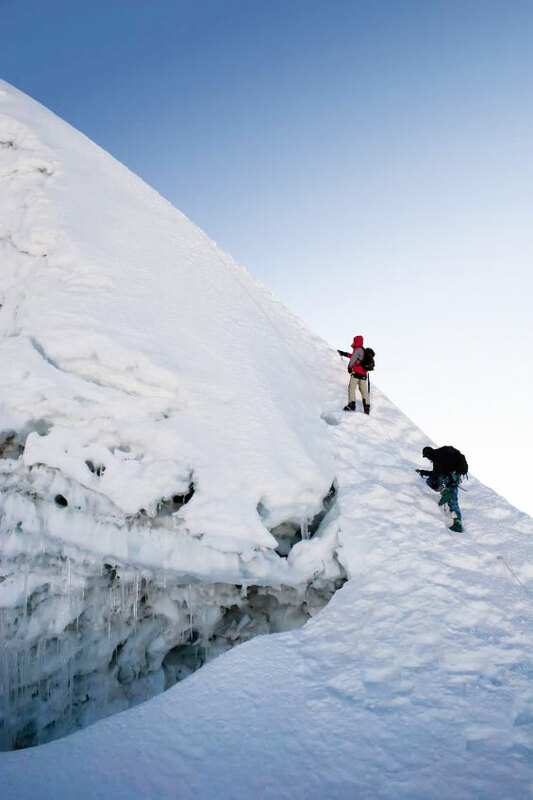 We hike cross a large snow plateau climbing a 34-degree snow covered headwall using fixed ropes. 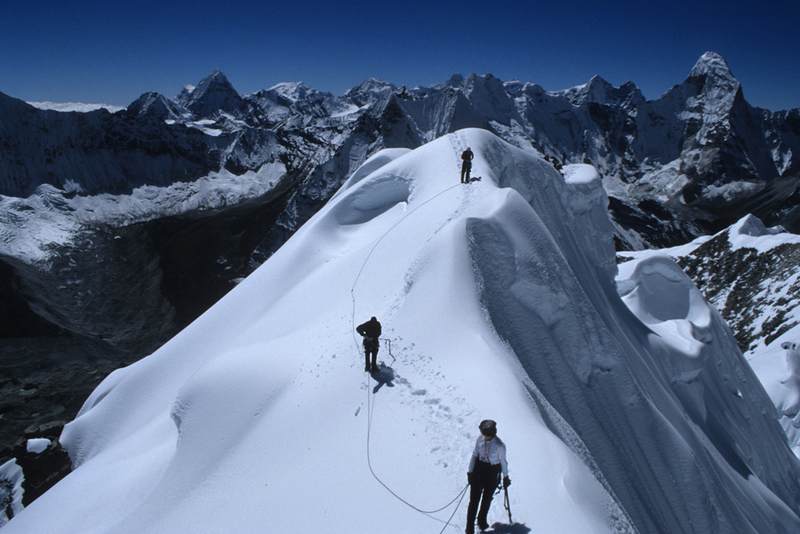 We trek to the summit shoulder and climb the final 15m to the summit using ropes. Once there, we are treated to awe inspiring views of the surrounding Himalayas. (8/9/10 hour trek). Day 11 Chhukung to Tengboche Leaving behind the views of the High Himalaya we trek back to Tengboche. (7 hour trek). Day 12 Tengboche to Namche Bazaar After an early morning view of Mt Everest from just above the lodge we hike via Sanasa and Khumjung to Namche Bazaar. (4 hour trek). Day 13 Namche Bazaar to Lukla (2,850) We trek downhill through the pine forest, leaving behind Everest, and across several bridges on the Dudh Kosi to greener vegetation and cultivation among the Sherpa villages. It’s time to chill out, maybe drink some alcohol and pig out on better quality food. (6 hour trek). Day 14 Lukla to Kathmandu A hair-raising take-off down the runway commences the return flight to Kathmandu. Don’t worry though, it’s not true that the planes take off and glide before starting the engines! We hope you’ve had a great trek, some once in a lifetime experiences, tightened your belt a few notches, have lots of fond memories and of course we look forward to trekking with you again on your return to Nepal. Price US$ 2,100 per person for 2 people or US$ 1,950 per person for 4 or more plus accommodation in Kathmandu. Price includes Airport pick-ups and drop-offs. All inclusive trek costs; camping equipment and/or accommodation in twin bed rooms, breakfast, lunch, dinner, trekking and park permit fees, climbing equipment, guide and necessary porters and all their costs such as transportation, accommodation, food, equipment, insurance etc. The flights between Kathmandu and Lukla.